If the funeral is local and you don’t need delivery service, you will get the best selection and price by going to a local florist, or even a good supermarket floral department. Some of the best foliage plants for funerals (or any other purpose), for example Chinese evergreens and philodendrons, are often in good supply in retail stores, yet very hard to find online. If the funeral is far away, call a local florist there and ask if they have especially desirable foliage plants on hand. I have received wonderful service by handling out-of-town floral orders by phone. Just need to get order done? All of the major online plant sellers promise next day delivery with dish gardens, which can be a treasure trove of memory plants. 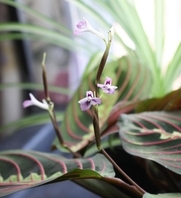 My flourishing prayer plant (Maranta) had its beginnings in a small dish garden received in my mother's last days, and it has emerged as one of my favorite indoor plants. You can choose dish gardens made up of low-care succulent plants, as well. A nice rubber plant or bonsai jade will take you into a higher price range, but one could hardly ask for more forgiving, adaptable plants for funerals and the healing time that follows. 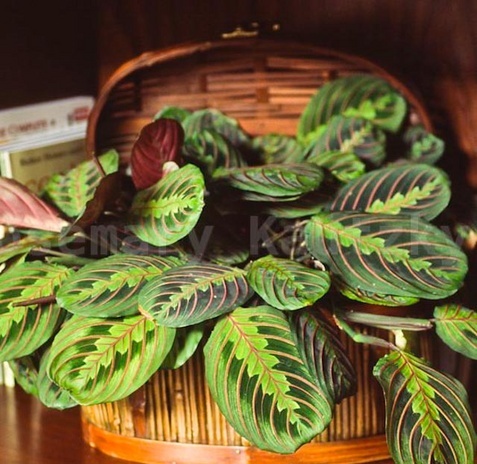 Photo of prayer plant (Maranta ) by Rosemary Kautzky. Plants brought home from the funerals of loved ones are supposed to serve as life-signs for our memories, which would be great if they didn’t die. But in fact many do, which makes us feel guilty because we really should do better by dear old Dad. Eight years after my beloved father passed away, two plants remained from his funeral -- an anchor philodendron (Philodendron bipinnatifidum) that lived with me, and a winsome rainbow dracaena (Dracaena marginata) that graced my mother’s living room. Eventually the philodendron got too big to keep, but years of healing had passed and it didn’t hurt a bit to chop it into the composter. Instead, it felt good to let it go. 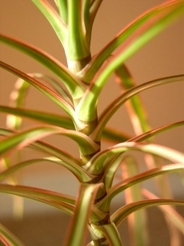 I think my mother came to feel the same way about the dracaena, which she pitched in her last days, as she got her own house in order. Plants kept from funerals should give suriviors something to hold onto for as long as they need it, and then provide a tangible totem when they're ready to let go. The last thing your deceased loved one would want is for you to spend money you don’t have on flowers or plants. 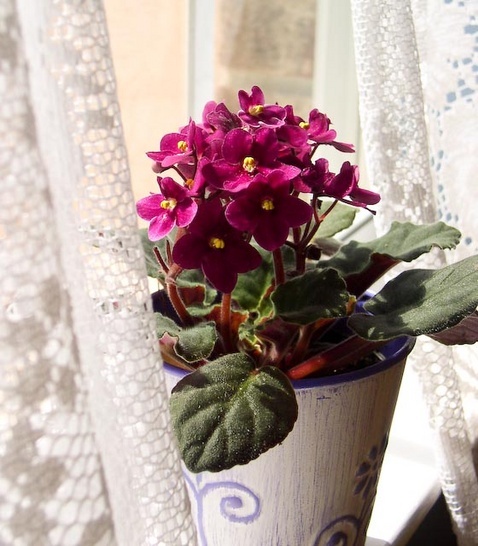 There is nothing wrong with sharing a plant you have grown yourself as long as it is attractive and nicely potted, like the cute African violet above. Thrift stores are often great places to find vases or pots. Another idea is to make a small funeral swag for the family’s door or mailbox using greenery from your yard woven with black ribbon and lengths of inexpensive black and white tulle, or wedding net. If there is to be a picture or memory table, use greenery from your yard and excess blossoms plucked from arrangements to dress it up a bit. There is often a rush to leave the church or funeral home following the service, and the family may not have realized how many plants need to be gathered up and transported. This is an excellent job for a plant lover, and a wonderful way to make a sad day less stressful for everyone. Small plants that can easily be carried home in a car make wonderful memory plants, whether you buy them or pot them up from your collection. 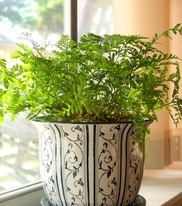 A tough little rabbit's foot fern will make a happy presence in a sunny kitchen. Family and friends who must choose among funeral plants to take home should look for plants with staying power. In addition to dracaenas, philodendrons and variegated prayer plants (often included in dish gardens), rubber plants (Ficus elastica) and jade plants (Crassula ovata) are always strong long-distance runners. And even if you know nothing at all about houseplants, you can grow a Chinese evergreen (Aglaonema commutatum). Like many families, we experienced peace lily panic when the spathiphyllum Mom chose as her memory plant from Dad’s funeral refused to grow. 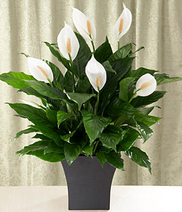 Tip for Funeral Families: Ask about leaving peace lilies behind at the church, or donate them to a church in a non-prosperous area. The people at the church won’t be bothered when the plants go downhill and it’s time to pitch them, which is their invariable destiny. This will save you much grief and guilt. I bought my first copy of Good Grief after my father died, at the suggestion of a pastoral counselor. Since then I have shared this little book with many friends in mourning. It is a great comfort. Copyright 2013 - 2017 by Barbara Pleasant. Top photo of red maranta (prayer plant) copyright by Rosemary Kautzky.